Braces aren’t just for kids anymore. In fact, 1 in 5 orthodontic patients is over the age of 21 and many adults in their 50s, 60s and 70s are seeking orthodontic care. With the invention of more discreet orthodontic appliances such as clear braces, Invisalign invisible aligners and hidden braces placed behind the teeth, adults feel more comfortable while they are improving their smile and bite! While adults can experience the same results as children and teens in terms of achieving a beautiful smile and functional occlusion, treatment can sometimes take longer because the jaw bone in an adult is fully formed and therefore less receptive to orthodontic forces. In addition, gum disease and tooth wear may hinder the progress of orthodontic treatment or require additional treatment time and techniques to achieve an ideal result. 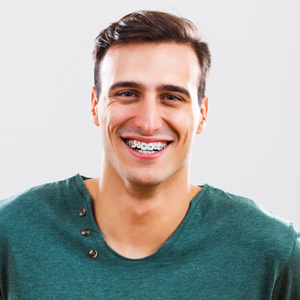 Orthodontic specialists have the education, experience and specialized techniques available to achieve ideal results even in complex cases that many adults present with. Only trust a board-certified orthodontic specialist to perfect your smile just as you would choose a medical specialist for medical care! Before beginning orthodontic treatment, we will perform an initial examination to determine the underlying dental misalignment and occlusal discrepancies as well as identify any pre-existing dental problemssuch as active gum disease or dental decay / cavities. It is important that these pre-existing dental conditions be remedied prior to starting your orthodontic journey. We recommend you visit your dentist to make sure you are ready to begin orthodontic treatment. WE WELCOME PATIENTS OF ALL AGES IN OUR PRACTICE! IT’S NEVER TOO LATE TO GET THAT SMILE YOU’VE ALWAYS WANTED! CALL FOR YOUR COMPLIMENTARY CONSULTATION TODAY.